Australians love their big cafe breakfast, in fact I’m going to go out on a food ethnography limb and say we invented the modern cafe breakfast. As a nation we don’t have that many claims to culinary glory but the big Sunday surfers’ brekkie washed down with loads of coffee or lashings of tea is something we have done really well since the eighties. 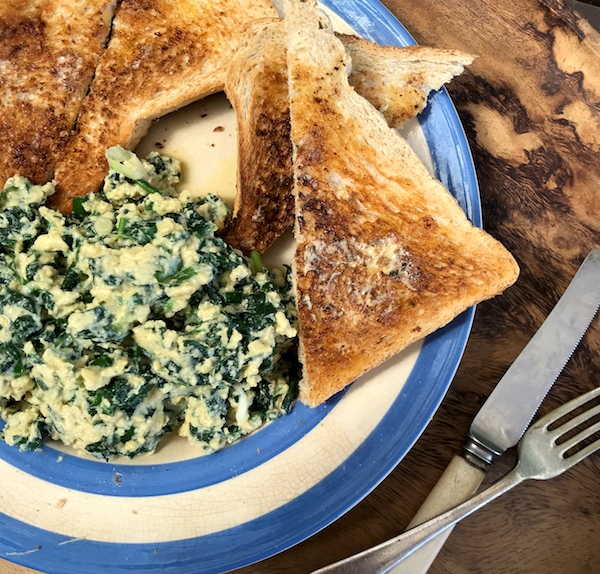 There’s been a lot of food fads in cafe breakfasts over the years, some version of avocado on toast with various fixings has remains a fixture on menus around Australia but the once popular green eggs or eggs scrambled with spinach, soft herbs and feta seems to have dropped off in favor of more fancy pancy versions of breakfast spinach and eggs. This is a pity, because green eggs was always one of my favorite cafe breakfasts. I’d always be torn between some new comer on the block but I’d always go back to green eggs because I love my greens in what ever form they come in. About a year ago I got nostalgic for green eggs for breakfast and started making my own at home. On my first few attempts the sautéed spinach released too much liquid so the eggs were watery and didn’t fix properly even with the addition of cheese. I solved that problem by blanching, draining and then squeezing the water out spinach before adding them to the eggs. I scramble eggs over a low even heat and use either a non stick or cast iron fry pan. If you’re using a cast iron pan make sure you remove it from the heat in plenty of time so the eggs can continue to cook without over cooking the eggs. This is was how my mother taught us to scramble eggs, we always had delicate soft curd eggs in our family and I remember having sleep overs as a kid and politely eating eggs scrambled into large, hard, overcooked curds that were some sometimes even browned (Oh the horror). But if you prefer large curd eggs or you’re a bit unsure of your egg scrambling technique this Serious Eats post goes into scientific detail on the art of cooking scrambled eggs. 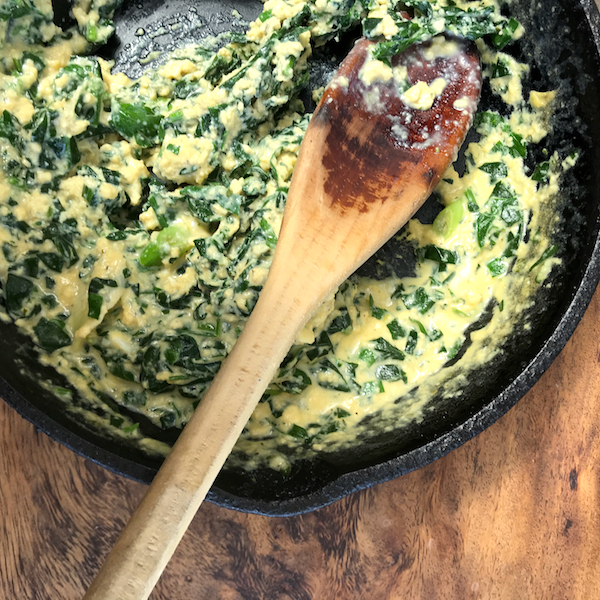 This is not so much a recipe as a method to making green eggs, use whatever soft herbs you have to hand – parsley, chives, dill to up the greenness of the eggs. If I haven’t got any soft herbs around I add a bit of Gurwurzhaus ranch spice to the eggs when I season them. Don’t fuss too much about the quantities because it’s all good. I prefer feta cheese with green eggs but if I don’t have any feta on hand I’ll add some grated parmesan. I always add the cheese just before the eggs have finished cooking or even after I’ve taken the eggs off the heat. This is when my mum used to add the cheese when she made scrambled tomato eggs. The cheese melts with the heat of the eggs but doesn’t toughen up at least that was my mum’s theory. These green eggs are too good to have just for the occasional big brekkie brunch. They make a great Sunday night supper and are good as a soft taco filling or with chapatis. A handful of raw spinach, lightly blanched, drained, cooled, squeezed and chopped finely. (If you’re using baby spinach make sure you don’t over cook it just lightly wilt it before draining, and squeezing the water out. A tablespoon or two of soft herbs finely chopped – parsley, chives, dill or even basil all work. Lightly whisk eggs with milk and season with salt and pepper. Add finely chopped herbs. Melt butter in small non-stick frying pan, add sliced green onion and saute gently until tender. Add chopped spinach and stir round pan before adding eggs. Cook over a gentle low heat until curds form. Just before eggs are done add cheese, when melted through remove from heat. Serve immediately with buttered toast. If you want to go the full big brekkie baked mushrooms are really good.